As usual, there seems to be an abundance of curious tree-pruning advice around. 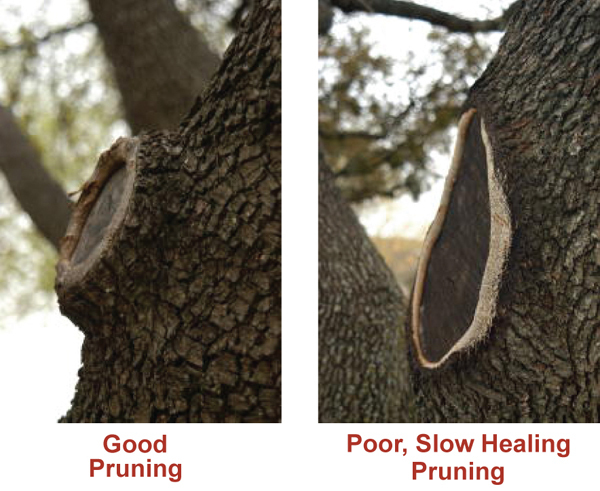 Yes, it is a good time to prune; however, pruning too much is the most common pruning mistake I see. Few trees need major pruning every year. Other than some fruit trees, few trees need annual thinning. Unless lower limbs are a physical interference, they should be left on the tree. Trees can be severely damaged or even killed by removing too many lower limbs. Plus it looks bad. AMOUNT OF PRUNING: Pruning trees is part science and part art. Don’t try to change the character and overall, long-term shape of a tree and don’t remove lower limbs to raise the canopy. Low growing limbs exist for a reason. It’s very unnatural to strip tree trunks bare. Remove dead, diseased, broken or damaged limbs and the weakest of crossing limbs. Remove limbs that grow toward the center of the tree and limbs that are dangerous or physically interfere with buildings or activities. Removing the co-dominate upward shoots to leave one strong growth without “V” shaped crotches is very important. Thinning to eliminate a certain percentage of the foliage is usually a mistake. Heavy thinning of a tree’s canopy throws the plant out of balance, inviting wind and ice storm damage. The resulting stress attracts diseases and insect pests. Gutting (heavy interior pruning) is never appropriate. PRUNING CUTS: Pruning cuts should be made with sharp tools. Hand tools such as bow saws, Japanese pruning saws, loppers, and pole pruners are good for small limbs. Chain saws (I use STIHL chainsaws) can be used for larger limbs, but only with great care and a thorough understanding of the equipment. Flush cuts should never be made. Cuts leaving 1/16” stubs are also bad. Pruning cuts should be made at the point where the branch meets the trunk, just outside the branch collar. The branch collar stub can be as small as 1/8-1/4” on small limbs but can be several inches to as much as a foot or more wide on large limbs. It will also be wider at the bottom of the limb than at the top. Cuts made at the right place leave a round wound. 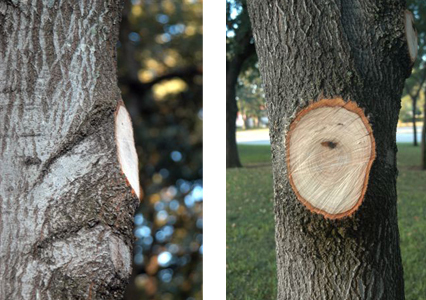 Improper flush cuts leave oval cuts and cause cavities to form in trunks long term. It’s scientific fact that cutting into or removing branch collars cause problems. Flush cuts encourage decay at the top and bottom of the cuts. 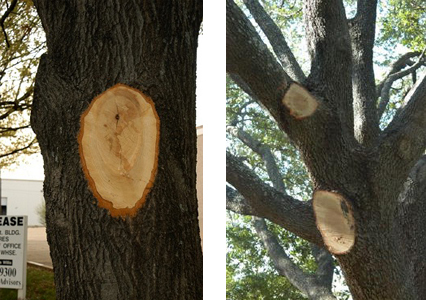 They also destroy the natural protective zone between the trunk and the branch, and can cause several serious tree problems including discolored wood, decayed wood, wet wood, resin pockets, cracks, sun injury, cankers, and slowed growth of new wood. Proper cuts are round, smaller and heal much faster. Peach, plum, apricot, and other fruit trees are particularly sensitive to flush cuts. Many fruit tree insects and disease problems are related to improper pruning cuts. Long branch stubs can also be detrimental sometimes and should be avoided; however, it is always better to err on the side of stubs too long rather than too short. WOUND DRESSINGS: Research by Alex Shigo, Carl Whitcomb, and the U.S. Forest Service has shown that pruning paint and wound dressings have no benefit and can be harmful by slowing the healing process. Healthy tissue needed for callus formation can be damaged or killed by pruning paint or dressings. Trees have defense cells, much like white blood cells in mammals. These lignin cells are produced on the backside of a wound to naturally prevent diseases from entering fresh cuts. Just as a cut finger heals faster when exposed to the air, so does a tree wound. CAVITIES: Cavities are often caused by flush cuts. Cavities in trees are voids where fungi have rotted healthy material. They are usually the result of physical injury. Removing only the decayed material is the remedy. Fillers such as concrete and foam are at best cosmetic and not recommended. When removing decayed matter from cavities, be careful not to cut or punch into the living tissue. Injuries to healthy tissue can introduce further decay into the healthy wood. When cavities hold water, drain tubes are sometimes inserted to release water. Bad idea. Drain tubes puncture the protective barriers between the rotted and healthy wood and allow decay to expand. CABLING: Weak crotches between limbs can sometimes be stopped from splitting by installing cables horizontal to the ground so the natural movement of the tree is not completely stopped. Cabling used to hold up low-growing limbs is poor tree care and a waste of money. Cabling can be very dangerous and should only be done by professional arborists. In most cases, I do not recommend it. Again, removing half of the “V” shaped vertical growth is a better way to prevent the splitting and have a healthier tree. As a final note, the tree trimmings resulting from pruning should not be hauled away. The large pieces should be used for firewood and the limbs and foliage should be shredded and used as high-quality mulch under trees, mixed into a compost pile, or left in a pile to become excellent compost. This is also excellent mulch for walkways in the landscape and vegetable garden.